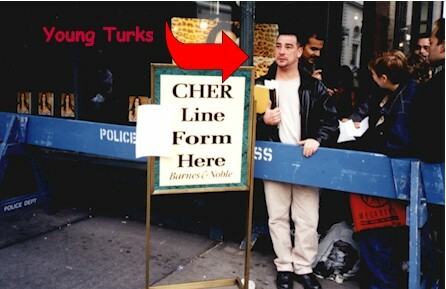 Stand in Line Five Hours and Meet Cher -- It Could Happen to You! 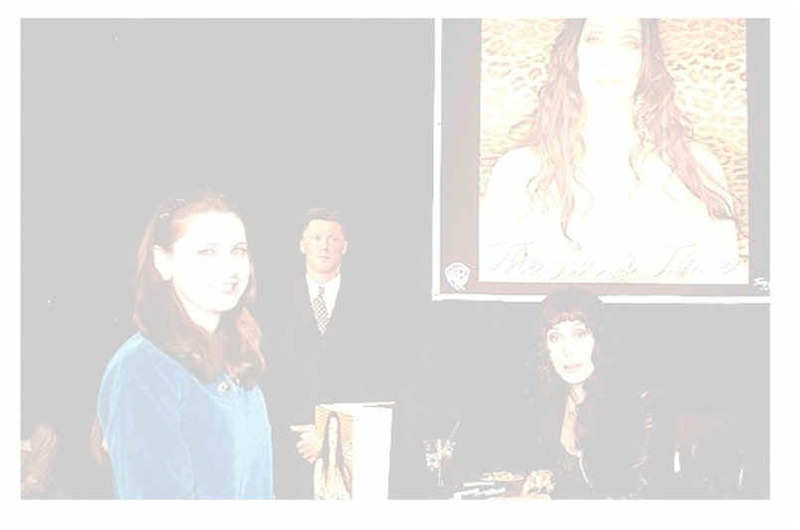 Always wanted to go to a Cher book signing and never had the spare five hours to do it? Yeah...well, you're lucky I was there to do it for you. Cher made an in-store appearance at the Barnes & Noble in the Chelsea sector of New York City to kick off a media blitz for both her new book, The First Time, and her new album, Believe. It was just like meeting the MGM Lion when I was an awkward bowl-headed, wood-necklace wearing punk.... except that Cher hadn't been tranquilized. Now, I'm of firm mind and belief that one should never meet celebrities. They should be left unmolested as much as possible. Besides, it usually never works out: you meet the celebrity, hitherto nothing but an object to you, a picture in a magazine, particle-dots on your television, a figment of your imagination; and you must reconcile this person with a former object and it just wont fit. You're left uneasy, disoriented, and sometimes disappointed. What if Cher's a jerk? Julie, the co-editor of Ape Culture, is of quite a different opinion on the matter... obviously, having stood in line 6 hours for Ozzy Osbourne, 5 hours for Duran Duran, 10.5 hours for Black Sabbath and 6.5 hours for a dead celebrity during Death Week at Graceland! That's a total of 28 hours! During the whole epoch of my hesitation, Julie pushed the AdvenCher as a potential essay for Ape Culture. This was celebrity obsession I could digest: work related. And with this altered state of mind, I took a break from my hard-labor secretarial duties and requested a long-earned vacation day. That morning I put myself on a no-water, no-food diet. I could not count on anyone saving my place in the Cher line while I combed the NYC streets searching for a public restroom. "What if I make no friends in line today, mom?".... too many grade school scars. Besides, the hunger pains would dupe me into thinking I wasn't nervous. I arrived on line at 8 a.m. sharp for a 12:30 p.m. Cher sighting. I counted myself approximately number 14th in line behind such fans my future line-mates would dub, Fabio and Margaret Thatcher. I had spent ten to fifteen minutes in the mild 50ish degree weather looking around at nothing in particular when the man in line next to me asked if I had been a Cher fan long. This is how I met Jeff. Jeff had come all the way from Allston, Massachusetts, bringing with him flowers and a very lovely black and white Cher portrait he had done. He showed me three Polaroids he had taken at prior Cher sightings. Soon I met Jeff's friend, John, and another woman from Long Island, Marie, who was not a rabid Cher fan but, being unemployed at the moment and recently separated from her boyfriend, was in the mood for some spontaneous fun. Jeff, John, Marie and I got to know one another via five hours of chitchat. To their credit, it didn't seem like five hours. To recall the Einsteinian description of time relatively made by Steve Martin in The Jerk: five hours at work the day before seemed like twelve hours, whereas, five hours in line in front of the Chelsea Barnes & Noble seemed like only 2.37. We laughed, we cried, we swapped trivia. Throughout the morning we heard rumors that Cher had a tendency to arrive late and leave on time. And the line was getting longer. But I felt confident, even though maybe forty people had cut in line in front of us, that we would make it inside to meet Cher before she started getting cranky. Then I saw someone who looked like Angel Martin from Rockford Files standing in the street, although in New York City everyone looks like Angel Martin from Rockford Files. He turned out to be a Barnes and Noble employee who offered to open up our CD's with his specialized razor. 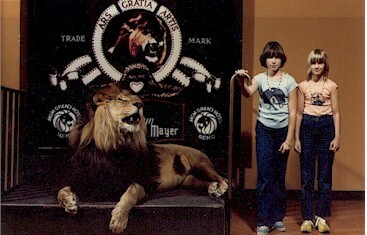 He reminded us that although we could not have our picture taken with Cher, per se, we could have a B&N employee take a picture of us while we were getting our book and CD graffitied... just like those candid pictures of flailing-armed kids flying down the log-flume ride. Thank God I had thought to bring my camera, if only for some outdoor, scene-setting shots. At 12:30, right on time, mind you, we could hear a hoopla behind the window. At the top of the window covering, we could see the reflections of hundreds of flashbulbs going off for what seemed like a Cher-pupil-burning period of time. A very nervous Cher fan began pacing up and down the street. We worried about her possibly passing out. Two mild mannered men behind us struck up a very obtrusive conversation about their lives as drug dealers and the history of pot in America. The line began to move. We turned the corner onto 6th Avenue. I could see the New York City world of noon spread out and bustling. Marie and I started to get giddy and over-heated and we combed our hair, took off jackets, put on jackets and shuffled our packages in an effort to strike a pose best presentable to Cher. 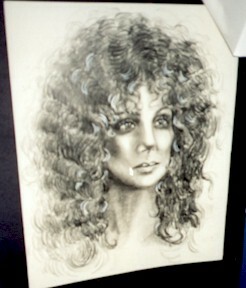 Jeff took the sketch of Cher out of his portfolio case. Marie and I took pictures of it, oo'd and ah'd it some more. Five-person clumps were let in at a time. Marie and I were frantic to be let in with John and Jeff, insisting Jeff go first so we could see Cher being presented with Jeff's picture. We were ushered into the B&N vestibule for a final Cher-briefing before we were officially let in. From there I caught my first glimpse of Cher....through the vestibule glass, her hands moving, seen darting in between the various "Cher handlers" standing about...human hands with black fingernail polish on them. Human hands! A handler in the vestibule reminded us to please not ask Cher for personalized autographs, and not to ask to have a posed picture taken with her. "If you ask her, she's too nice to say no. But we have to get as many people in here today who want to see her....blah, blah blah." I could see the line ahead was moving slow and although this meant dastardly disappointment for the kiddies at the end of the line (well, they should have gotten here earlier! ), I was glad to see I would be given time to gawk. "Don't blink or you'll miss it," they all said. I saw a woman holding her hands up to her mouth and shaking, half-crying, clearly overwhelmed. "Look at that girl," I said to my new co-horts. Privately I was thinking, Whatever you have to do Mary, keep it together. Don't crumble. Keep your composure. This is just a person, no different from any one of those nameless handlers surrounding her who I can't seem to recall anymore. I noticed this was turning out to be no 'assembly line' signing. One person at a time could approach the table to have literally Cher's undivided attention. And Jeff was up. A Cher-handler frisked his flowers. I was handing my coat and camera over to a handler as I heard Cher exclaim, "I'll take everything" and I looked up to see Jeff handing her flowers and portrait. He leaned in, kissed her hand twice, making the handlers very nervous. In fact, they really fretted about it..."He's touching her. He's touching her." I walked up to the shiny black wooden table and handed Cher my book, already opened to the correct page 'cos I'm such a good doobie. I quietly laid my hands on the table and thought maybe I didn't look like the scared bird I was. I remember now how huge and sparkly her eyes were. I didn't see any body parts that looked artificial or askew. "How are you doing?" she asked me very pleasantly. "Fine, how are you." (Wow, a conversation!) "What's your name." My name? She's insisting on personalizing this autographical moment! Holy Toledo! Who am I to argue with this? "Mary"... then silence, awkward silence. What to say, what to say. At other signings I'd heard about, namely Julie's Virgin Megastore events, there hadn't been much discourse between celebrity and gawker. But Cher had set this pace at Slow and Casual. Hours earlier, we had discussed what we would say if we could say one sentence 'at' Cher. I had remarked that Cher must find it very tiresome to listen as everybody tried to grandstand their one sentence, and how impossible it would be to come up with one outstanding soundbite among hundreds. As I went up to the table, I figured sincerity would be the best policy (more so than something obviously rehearsed). Since there was no one on-hand to slap that ridiculous idiocy right out of my head, I hadn't prepared a statement. "I just wanna say that my favorite song is 'Somebody'," I said. She looked up, very blankly. Very, very blankly. Like she was waiting for something more. Like maybe she didn't remember ever recording the darn thing so many years ago. Like maybe I was confusing her with someone else! "...from the All....I....Ever...Need...Is...You....album" I tried to say but I had lost my breath and could barely get the words out. "It's really great." Silence as she finished signing my stuff . God, I hope I didn't say from the If I Should Love Again album, by mistake. If I Should Love Again! How could I confuse or compare a Barry Manilow album, something from a little pre-adolescent, dork phase to some song that had inexplicably set my life on its particular aesthetic course? (Don't ask!) Duh! I told her what my favorite song was. How stupid. "Uh, my favorite song is ‘Somebody’...uh, it's really great...from the, uh.... All I Ever Need Is You album." My one sentence to yes, the human embodiment of a celebrity obsession. I could have asked her about the single, about a possible tour. I could have told her how I really loved the new book and album.... and I don't love everything she does (Mermaids, her whole Bon-Jovi, Schlock-Rock phase of 80s albums). I wouldn't have lied. Later, when I got home, I called my mom, as she is the one who has borne the biggest brunt of my Cher fandom. When I was 7 years old, already at least two years into my obsession, she asked: "Why do you like Cher? She's got crooked teeth." But she made sure I had the Cher doll, the Sonny & Cher Live album I so coveted from Record Bar, and the Sonny & Cher stage! (My eight-year-old self almost fainted when I unwrapped that orange and blue plastic beauty). "Did you tell her you've been a fan since you were a little kid?" she asked me. "No Mom, I'm sure she hears that all the time." "So what. You should have told her anyway." Maybe my mom was right. Damn, I screwed up my one audience with Cher. My rationale: 'Somebody' is the last song on the Sonny & Cher 1972 comeback album. I love the LP version, not the MCA CD re-release (which takes out the unnamed gospel wailing at the end) or the 45 rpm version (which has an added intro and alternate lines in the fade-out). The LP version of this song tops a list of my favorite Cher songs most of which don't happen to be Sonny-penned ones, but this one is and the lines are sparse and prophetic: "In a world of wonderland, one thing's plain to see...and it don't take no mystic mind at all..."
Over the years, my appreciation of the song has only become more stalwart and rich. So, I'm not sorry that this was the one thing I said to Cher because it is the one thing that most encapsulates what I am such a fan for. The thing that I most like about her. The only thing I could say that is most true. No, I'm not sorry that's what I said. I'm just sorry that I didn't express it with the feverish ardor in which I felt it. That if I was stranded on a desert island and could take only one song, I would take 'Somebody' and never miss another song. But so concerned was I about maintaining a sense of dignity, about being calm, that I’m sure I affected only that. She gave me back my book and I thanked her. Then we turned to have our picture taken by the handler who was holding my camera. "Lean in" she said but I couldn't move. A Cher handler told me to be careful holding my CD booklet as the ink would smear and I turned to walk away. "Wait a minute, you forgot your camera," the camera handler said. They were comforting and motherly, I thought, looking back wistfully as I left. A Barnes & Noble employee smiled at me sympathetically like a parent does after watching you flub up a back-flip and he herded me through the maze of CD rows to where my group reconvened... dumped out into the book section, dazed to the sound of: "move aside, more kids coming." And then the thing was done. It wasn't all "I touched something Cher touched," but more akin to what Homer Simpson once said about television: Let us all bask in Cher’s warm glowing warming glow. It was like a long-lined ride that ends too soon, The Cher Spinner. And Jeff wanted to get right back on. Post a comment about Cher or book signings.